The 3.2kVA Subaru petrol generator comes standard with a 12.8L long range fuel tank, battery charging, heavy duty steel frame, and more. It is imported from Japan and is designed for the hire, industrial, agricultural, building, construction, council and mining industries. 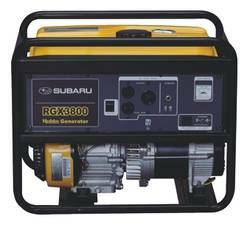 The Subaru RGX generator series is ideal as a portable power source, emegency stand-by system, mobile emergency service, factory & plant, and maintenance. AVR alternator systems also come standard to help prevent fluctuating power and create stable voltage for use when power is required for more sensitive equipment.